Sedation for oral surgery and dental implants is used to help alleviate anxiety and pain. Sedation is also used for bone grafting, tooth extraction and wisdom tooth extraction, to name a few. Today’s technology, including IV sedation, makes it possible to perform complex surgery in the oral and maxillofacial surgery office with little or no discomfort for the patient. 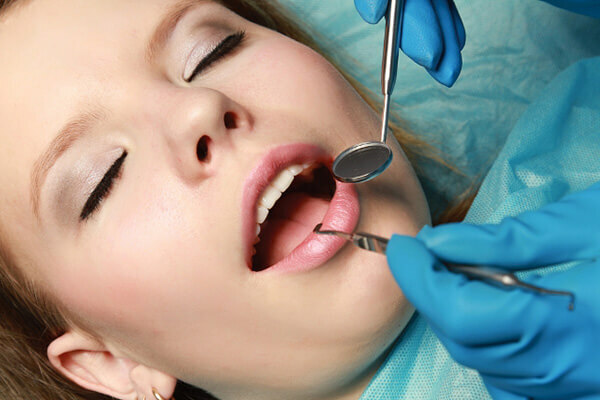 Understanding how sedation works during oral surgery should help reduce your level of anxiety. Moderate sedation (formerly called “conscious sedation”) — IV sedation. You may slur your words when speaking and not remember much of the procedure. Inhaled minimal sedation. You breathe nitrous oxide — otherwise known as “laughing gas” — combined with oxygen through a mask that’s placed over your nose. The gas helps you relax. Your Oral and Maxillofacial Surgeon can control the amount of sedation you receive, and the gas tends to wear off quickly. This is the only form of sedation where you may be able to drive yourself home after the procedure. Oral sedation. Depending on the total dose given, oral sedation can range from minimal to moderate. For minimal sedation, you take a pill about an hour before the procedure. The pill will make you drowsy, although you’ll still be awake. A larger dose may be given to produce moderate sedation. This is the type of anesthesia most commonly associated with sedation dentistry. Some people become groggy enough from moderate oral sedation to actually fall asleep during the procedure. They usually can, though, be awakened with a gentle shake. IV sedation, which is considered moderate. You receive the sedative drug through a vein, so it goes to work more quickly. This method allows the dentist to continually adjust the level of sedation. Regardless of which type of sedation you receive, you’ll also typically need a local anesthetic — a numbing medication at the site where the dentist is working in the mouth, to relieve pain, if the procedure causes any discomfort. The ability to provide patients with safe, effective outpatient anesthesia has distinguished the specialty of oral and maxillofacial surgery since its earliest days. As the surgical specialists of the dental profession, Oral and Maxillofacial Surgeons (OMS) are trained in all aspects of anesthesia administration. Following dental school, Oral and Maxillofacial surgeons complete at least four years of training in a hospital-bawsed surgical residency program alongside medical residents in general surgery, anesthesia and other specialties. During this time, OMS residents must complete a rotation on the medical anesthesiology service, during which tehy become competent in evaluating patients for anesthesia, delivering the anesthetic and monitoring post-anesthetic patients. As a result of this extensive training, Oral and Maxillofacial Surgeons are well-prepared to identify, diagnose and assess the source of pain and anxiety within the scope of their fiscipline and to appropriately administer local anesthesia, all forms of sedation and general anesthesia. Further, they are experienced in airway management, endotracheal intubation, establishing and maintaining intravenous lines and managing complications and emergencies that may arise during the administration of anesthesia. Commonly, patients describe their feelings during surgery as comfortable and surprisingly pleasant. After surgery, you may be prescribed a pain medication to make you as comfortable as possible when you get home.